Now, we all know Kelly Osbourne is not one to shy away from beauty risks (she’s had purple hair for how long now? ), but I’d argue that last night she took that adventurous streak a bit too far. 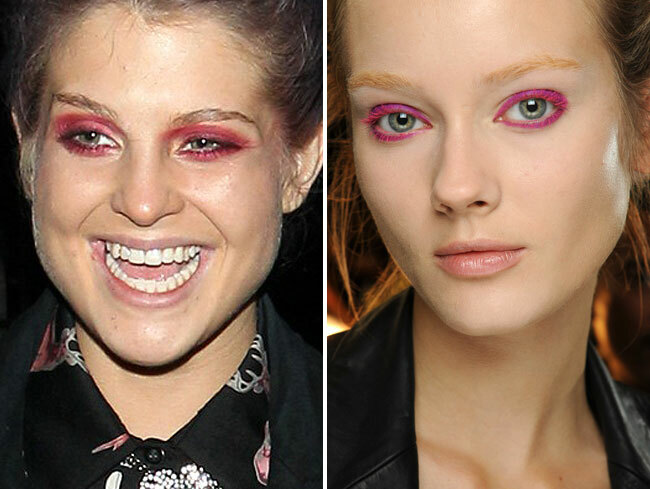 Her hot pink eye makeup looked a lot like the look models wore at Donna Karan‘s recent spring 2013 show — which, while striking on the runway, probably should have come with a “Do Not Attempt” warning label. While Kelly skipped the runway version’s bleached brows and monochromatic lashes in favor of black mascara and liner, there’s something about this shade of pink around the eyes that just looks like a disease. Let’s just say it wouldn’t make our short list of wearable Fashion Week beauty looks anytime soon. What do you think? Do you give Kelly O. an “A” for effort? Or should she have avoided this shade at all costs?